On Wednesday night, the organizations co-hosted the second presentation of This Life Counts at the Katz JCC. The program is designed to get kids and parents talking to one another about mental illness and suicidal thoughts. Cherry Hill Chief of Police William Monaghan and Samost Jewish Family and Children’s Service Executive Director Marla Meyers provide introductory remarks during last Wednesday’s presentation of “This Life Counts” at the Katz JCC. JFCS and the Cherry Hill Police Department teamed up to create the program, which promotes suicide awareness and prevention in the community. 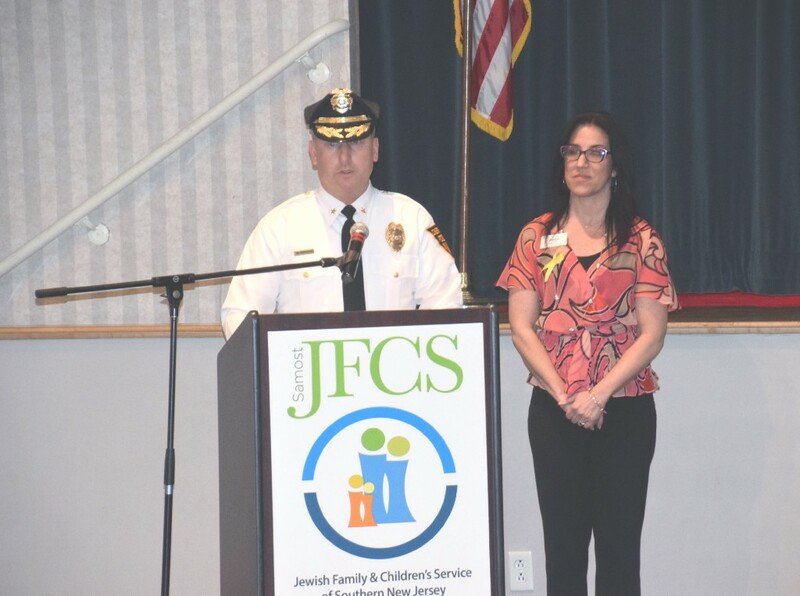 Last December, Samost Jewish Family and Children’s Service teamed with the Cherry Hill Police Department to host This Life Counts, a program to promote suicide awareness and prevention for both children and parents. JFCS officials expected to have a few dozen community members come to the first event. What they saw was overwhelming. Following up on the success of the first event, JFCS and the Cherry Hill Police held its second presentation of This Life Counts last Wednesday night at the Katz Jewish Community Center. The goal of This Life Counts is to bring the issue of youth suicide into the public eye and get the community talking about it. The Centers for Disease Control and Prevention recognizes youth suicide as a serious health problem. Statistics from the CDC cite youth suicide as the second leading cause of death for kids ages 15 to 24. In the last New Jersey Student Health Survey conducted in 2013, 10 percent of respondents said they had attempted suicide within the last 12 months. This was an increase from 6 percent when the state conducted its previous survey in 2011. The number of students who has considered or made a plan for suicide also increased from 2011 to 2013. JFCS and the Cherry Hill Police partnered for a program two years ago focusing on the heroin and opiate usage among young people. When the two organizations started thinking about ideas for other issues to address, suicide prevention and awareness was at the top of the list. “We both were eager to take on this topic because it’s something similar to the opiate crisis where people almost feel stigmatized and are afraid to discuss mental health,” Chief of Police William Monaghan said. The two presentations of This Life Counts featured a panel of mental health professionals, police officers and survivors who have dealt with mental illness and crisis situations. Wednesday’s panel included therapists Nancy Lubars and Elana Dobrowolski, psychiatrist Dr. Leah Rosenkrantz, Cherry Hill police officer Eric Neumann and Jon Burgwin, a representative from Minding Your Mind, an organization offering mental health services in the Philadelphia region. On Wednesday night, Burgwin shared his story of how he struggled with anxiety and depression while he was a teenager. The biggest message all of the panelists wanted to get across is it’s OK to talk about mental illness. The program also encourages parents to listen to their children and gives them resources for how to positively handle a child who may be having suicidal thoughts. The program is a good fit for the Cherry Hill Police, as they annually receive hundreds of calls from people who are in crisis. Monaghan said police officers go through training at the police academy so they know how to handle these situations. JFCS offers resources to individuals who are struggling with mental illness or have suicidal thoughts. Lubars works as a therapist for JFCS and feels discussing the issue on a large scale will only help with prevention. This Life Counts has had an impact on the local community. Nearly 100 people attended last Wednesday’s presentation. However, the real impact is what the attendees took away from the program. At the end of the night, kids and parents are broken into separate groups. The kids sit with therapists and police officers and are encouraged to open up about their struggles with mental issues. In a separate group, parents can speak with doctors about their side of the story and receive help for how to handle a child dealing with a mental illness. Lubars said she’s received letters, emails and messages from attendees who want to follow through as they deal with their own illness. She discovered the program has given many in the community the confidence to come forward and start talking about their struggles. The success of This Life Counts has inspired JFCS to take the program on the road. Meyers said the organization is meeting with other towns and police departments to see if the program can be hosted in other parts of South Jersey in the future.